Color koi tattoo with little yellow flowers. The fish has blue and white shading that gives it a Japanese anime look. 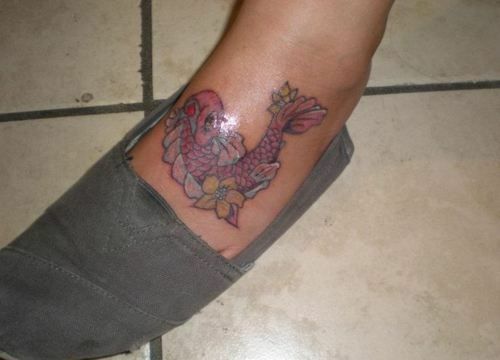 This cute little Japanese koi fish tattoo is on the top of the foot in a U shape up by the ankle. This mix of red and purple colors for the carp body and blue and white accent shading on its fins shows off the detail of the image. There are two small yellow lotus-like flowers by the tail and body that brightens up the art. The whole tattoo is stenciled with thin black lines to make each color stand out on its own. The koi fish is a popular Japanese symbol that is laced throughout their culture and religion. For Buddhists, a Koi symbolizes courage; in pop culture the image symbolizes luck, fortune and bravery for both genders. Many koi fish drawings are colored with reds and oranges which are associated with passion, intensity and strength.